To mark UK Parliament Week, Roy Beggs MLA visited the NID Skills for Queen’s Badge Course on Saturday 18th November. He shared his faith, his involvement in The Boys’ Brigade and some of the day to day daily life of an MLA. Roy sat in the hot seat and took questions from the boys; many big and topical questions were asked! The theme of leadership and the qualities make good leaders was developed over the weekend and how BB Leaders can demonstrate Christian Leadership serving God. 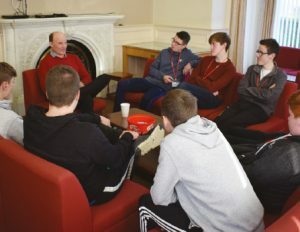 During the weekend the boys also had fun, debates, discussions and time to learn more about God and develop their faith.